The stand just when the festival opened. After years of walking the floors and helping out at the Copenhagen Beer Festival I finally realized my dream of having my own brand and my own stand. Over the weekend I have served several thousand samples of the five different varieties of beer. The attention was overwhelming and by nine o'clock on Saturday I found myself all out of beer. All types of people stopped by: From RateBeerians and beer bar aficionados to beer novices and importers. Many of the products that was served where leftovers from earlier batches that sold out long ago which was only brought to showcase the different styles that I have brewed. The two new beers that premiered on the festival was Hop Drop IPA which is an aggressive American style IPA and Dark Temptation which is a malty imperial porter. 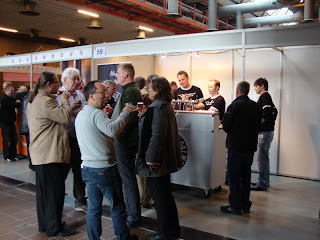 Several importers from Sweden came by and all displayed interest in importing the beers. Business cards were exchanged and hopefully before long, Croocked Moon will be invading bars around Sweden. The positive feedback has put a lot of things into perspective. It seems that the demand for the brand is there to start considering a form of expansion since the beer sells out on the day it is put on the market. I might also need to start thinking about bottling some of the beers in order to reach more consumers on a larger scale. This expansion in production requires help from other breweries that has a bottling line and the capacity to brew the beer. These are all things I will need to consider over the next couple of weeks. Last, but not least I want to thank all the people who came by the stand and tried the beer, and the amazing people who volunteered to bartend for me!